Every Christmas my goal is to come up with a pattern for a new nativity figure. There are a few color changes in this pattern. 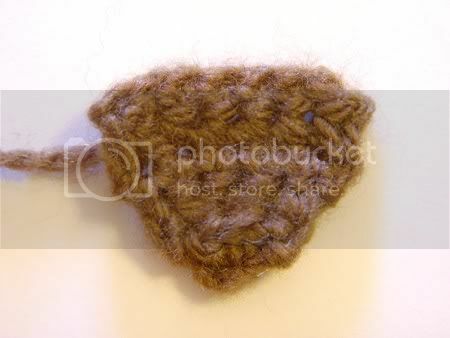 Aside from that, the most complicated part of the pattern to crochet is the headband which is crocheted in the round (as opposed to in a spiral which is the traditional amigurumi way). 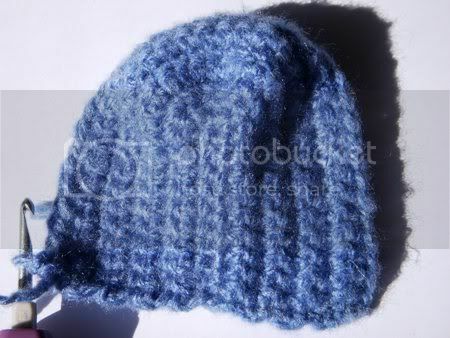 There are also a few pieces that are crocheted flat. 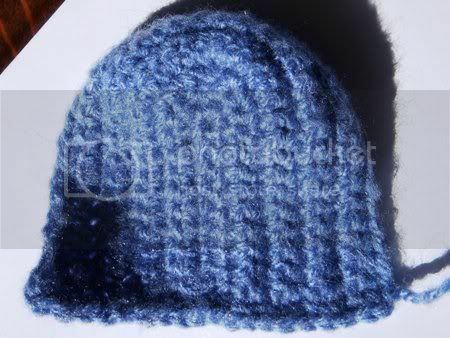 Bulky weight yarn in a flesh color, blue (for headcloth and robe), red (for body and headband) and brown (for beard and hair). I used Lion Brand Jiffy. You can stop there, but I like to run a chain of single crochet across the bottom to even out the edges. Here’s how to do it: After Row 9, ch 1 then sc across bottom (about 18 or 19 st). When you reach the end, ch 1 then slp st in first stitch on other edge. Bind off, weaving in tails. Unfinished bottom edge on headcloth. Single crochet across the bottom edge. Finished bottom edge on headcloth. Rnd 2: sc all. There will be a gap at the end so close it by slp st in the first st in the round. Bind off, leaving tail to use to sew on headband. 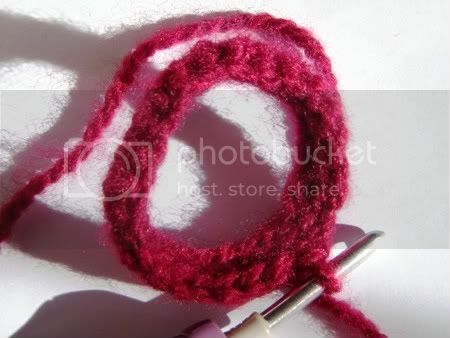 Join chain using slip stitch to form circle. 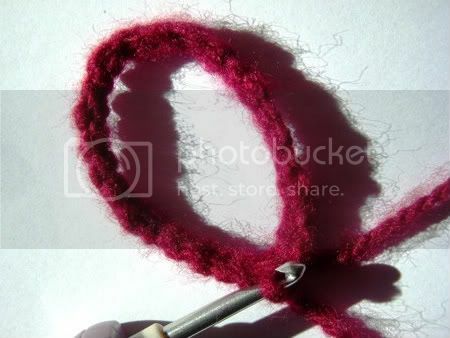 Close circle using slip stitch. Row 1: ch 11. sc in second chain from hook. sc in each chain 9 more times (for a total of 10 sts). ch 1 and turn. Row 2: sc across, ch 1 and turn (10 sts). Row 3: sc across, ch 1 and turn (10 sts). Row 4: 2 sc in first st, sc 8, 2 sc in last st, ch 1 and turn (12 sts). Row 5: sc across, ch 1 and turn (12 sts). Row 6: sc across, ch 1 and turn (12 sts). Row 7: 2 sc in first st, sc 10, 2 sc in last st, ch 1 and turn (14 sts). Row 8: sc across, ch 1 and turn (14 sts). Row 9: sc across, ch 1 and turn (14 sts). Row 10: 2 sc in first st, sc 12, 2 sc in last st, ch 1 and turn (16 sts). Row 11: sc across, ch 1 and turn (16 sts). Row 12: sc across, ch 1 and turn (16 sts). Row 13: 2 sc in first st, sc 14, 2 sc in last st, ch 1 and turn (18 sts). Row 14: sc across, ch 1 and turn (18 sts). Row 15: sc across, ch 1 and turn (18 sts). Row 16: 2 sc in first st, sc 16, 2 sc in last st, ch 1 and turn (20 sts). Row 17: sc across (20 sts). Joseph's Robe Edging: Note that the stitch counts in parenthesis in this section are approximate and may vary. 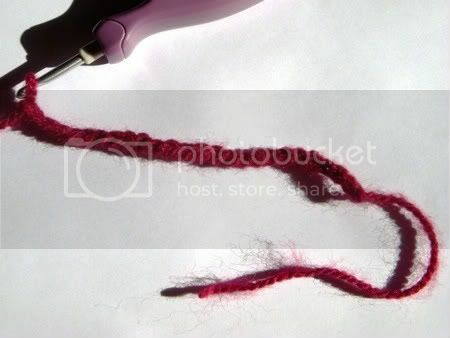 If you don’t end up using exactly the same number of stitches as I did, it’s okay. 1. Chain 1 and single crochet up the side, stopping about 2/5ths of the way from the top (9 sts). 2. To make the arm hole, chain enough stitches to be even with the top row (6 sts). 3. 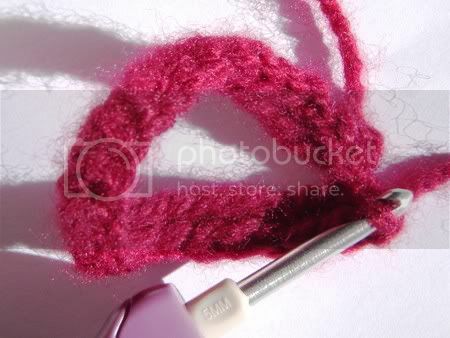 Use slip stitch to join the chain to the last stitch in the top row. 4. Chain 1, turn and single crochet back down the side (15 sts). 5. At the bottom corner, chain 1 and single crochet across the bottom row (21 sts). 6. At the end of the bottom row, repeat steps 1-4 for the next side. 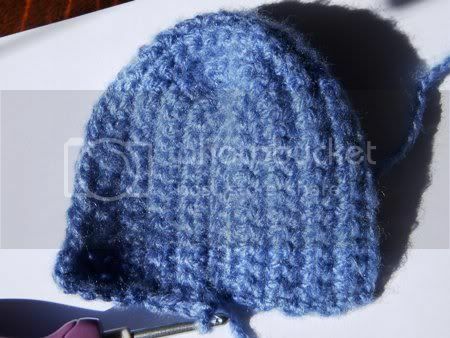 Then chain 1 and join it using a slip stitch into the first stitch in the bottom row. Bind off and weave in ends. Row 1: ch 8. sc in second chain from hook. sc in each chain 6 more times (for a total of 7 sts). ch 1 and turn. Row 2: sc across, ch 1 and turn (7 sts). Row 3: sc2tog, sc 3, sc2tog, ch 1 and turn (5 sts). Row 4: sc across, ch 1 and turn (5 sts). Row 5: sc2tog, sc 1, sc2tog, ch 1 and turn (3 sts). Row 6: sc3tog (1 st). Put headcloth and headband on Joseph and sew them down. Sew beard to Joseph's face. Add hair if desired. Put on his robe by sticking the arms through the arm holes. If you want his arms to be down instead of sticking out, you can hold them down and use some yarn to sew them to his sides. Pair Joseph with Mary and baby Jesus and enjoy your nativity! This is for sure going on my to do list my grand daughter loves my nativity's this way she can have her own and it won't brake. Thank you, Thank you Cathy, I have been waiting and waiting for this.... am just getting thru a couple of projects and then will make and post this..... adapted to pakistan, hehehehe, maybe with a turban? Thank you so much for these patterns! Since I found your Mary and Baby Jesus one I have been waiting for the next one to come out! I can't wait to make these and give them away at church! Six in one day burned me out and it took a while before I wanted to pick the hook up again to make one for myself and finalize the pattern. That's why it's taken me an extra month to get the pattern up! mamabanana I can't wait to see what you come up with, let me know when you have some pictures up on Ravelry! Do you have any patterns for animals, wisemen, or shepherds? ABrady, I am doing one new doll each year so it will be a while before all the patterns are here! I am making them for my family as Christmas gifts so I usually design and make them in December, then post the new pattern in January once I have had time to type it up. But if you are in a hurry to finish off your nativity, you don't have to wait on me to make more patterns. 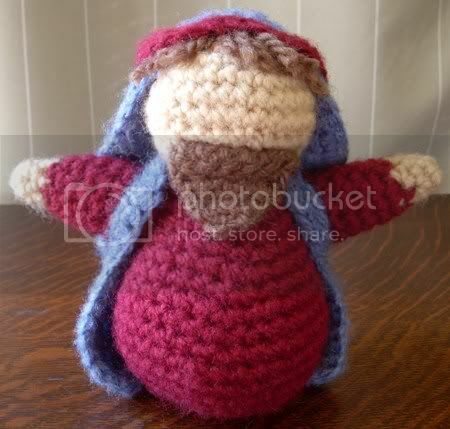 You can make a body for any of the other figures in the nativity by using the basic head, body and arm pattern from Joseph and changing the colors and decorations to fit. For example, give the doll wings and a halo and it becomes an angel, give it a crown and it's a wise man or a staff and it's a shepherd! Really from now on that is all I will be doing, just redecorating the basic body pattern to make new figures! As far as animals, I will be making patterns for those too eventually, but if you need a pattern now I suggest looking at Crochet Pattern Central, which has free crochet patterns. Here is a whole section they have just of farm animal patterns. Can't wait for the next pattern, I hope you do an angel next. Thanks for the picture! You are in luck, because the doll I made this Christmas for my friends and family was an angel. I need to make one last doll (for myself, I ran out of time to do it before Christmas), write up the pattern and then I will be able to post it here (hopefully before the end of January). thank you for sharing this patterns :-)..
Hi! I am wanting to do a nativity scene as a Christmas present for my mum. Her mum used to knit little characters. I can't knit but I can crochet. Do you have any patterns for the 3 kings and shepherd's too? Hi Jenny, glad you like the patterns. 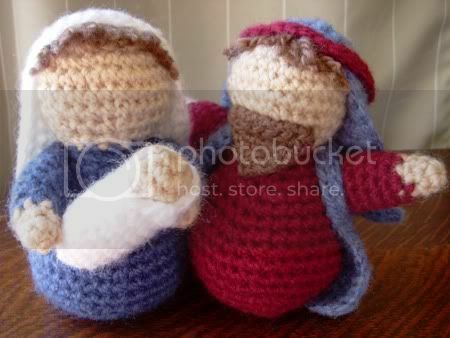 Right now I only have patterns for Mary and Jesus, Joseph, an angel and a sheep. I try to come up with one new pattern each year so at some point in the future there will probably be shepherds and wise men but it will not be any time soon. I think you could use the Joseph pattern as a base to make shepherds and wise men - just decorate them differently. The shepherds could have shepherd's crooks, the wise men could have crowns and gifts. Hope that helps!